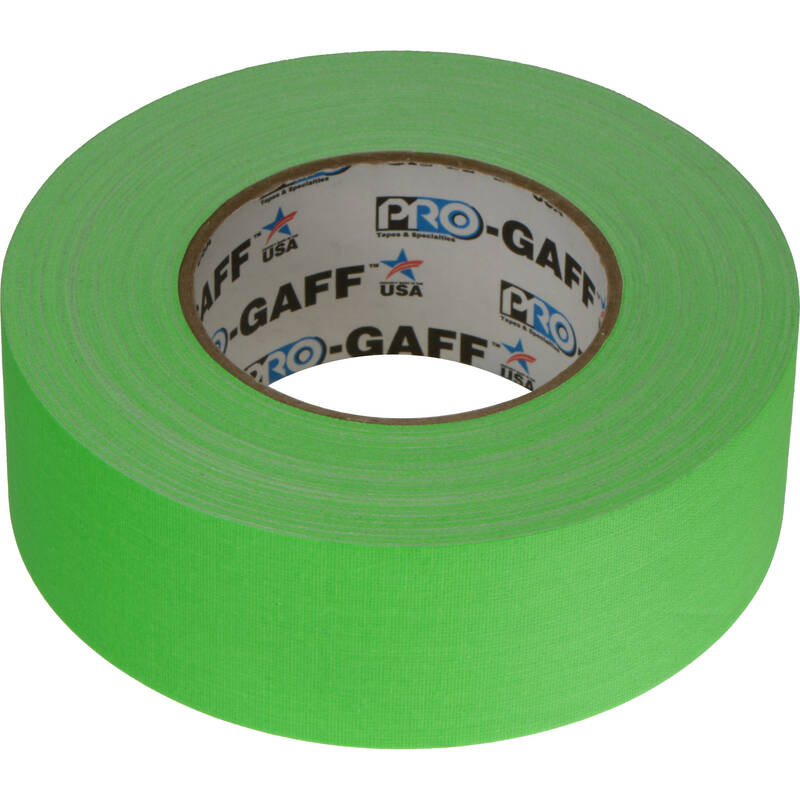 Take advantage of this roll of fluorescent green Pro Gaffer Tape from ProTapes, measuring 2" x 50 yards, to secure overhead lighting, audio wire, as well as set and stage decoration. It is also useful for artwork, framing, displays, graphics, and taping power cords down for a safer set. This Pro Gaffer Tape offers high tensile strength and a waterproof backing to withstand the elements as well as a long day of filming. It is highly conformable to a variety of expected and unexpected surfaces. It's easy to unwind and hand tearable, providing aggressive adhesive without leaving a sticky residue behind on your indoor or outdoor surfaces. Box Dimensions (LxWxH) 5.8 x 5.8 x 1.9"
Pro Gaffer Tape (2" x 50 yd, Fluorescent Green) is rated 4.9 out of 5 by 32. Rated 5 out of 5 by Anonymous from Great bright/caution tape Everything you could want bright yellow tape to be this tape is. It connotes caution, without all that pesky text. It sticks. It comes off. Tears easily. Holds a lot of weight. If you're looking for green tape or red tape, this is not for you because it is most definitely YELLOW tape. That's true if you're looking for blue tape as well (this is not blue tape). So far, all my yellow tape needs have been met with this product. Rated 5 out of 5 by George from Safety first I've decided to use this very visible tape anywhere that I'm securing seamless paper or cables to the floor when its brightness does not detract from the setting, especially in a studio. In a highly litigious world, it pays to remind everyone to use caution and be conscious of your surroundings. The quality of the tape is as good as any other gaffer's tape. Rated 5 out of 5 by Jaybe from Just the right tack I purchased this to hold my grids in my reflector. It is perfect in that it doesn't come loose when it's heated from my strobes. I have been able to have it hold my grid in place for an entire day. When I'm done I just pull it off and no residue. The color stands out and helps me not to forget to remove it from the mono block. Rated 5 out of 5 by Media Ministry Director from Bright and pleased I use this for Multimedia setups and areas where I will be having cables or wires in way of foot traffic if I'm not able to prevent it by other means. I like how its bright enough so people notice it in dimly lit places or in fully lit rooms. I like the fact it goes on cables nice and snug but it's clean and easy to remove. Rated 4 out of 5 by Anonymous from I will be buying more of this product. I use this tape in many ways. Great for a quick ID of your equipment, just tag an go. The bright colors are easy to see in the smallest amount on all your gear. Very sticky, holds tight, and leaves no glue behind when removed. Easy to write on with markers for labeling. Rated 5 out of 5 by Anonymous from Big roll When it says Pro Gaffer Tape, this is Pro Gaffer Tape. Great for marking positions and using on lighting and camera equipment because it holds all day and won't leave behind any residue. It's a can't-miss-color and the roll is huge. I will definitely purchase again. Rated 5 out of 5 by Liquitt Solutions from Pro-Gaffer never let's you down! If you ever used gaff tape you probably used Pro-Gaffer. Very good product with strong adhesive. Easy to rip in pieces yet strong as a whole. Very flexible. Color is bright and highly visible. Good as a spike tape or for marking steps, edge of stage, etc. Rated 5 out of 5 by JeanGapont from I would buy this product again and again I use this tape in many ways. Great for a quick ID of your equipment, just tag an go. The bright colors are help me to mark Actors as Focus Puller. Very sticky, holds tight, and leaves no glue behind when removed. Easy to write on with markers for labeling.